We are pleased to announce the immediate availability of Sandvox 1.6.6. This update solves several issues that people have reported over the last couple of months since version 1.6.5 was released. We’ve made a minor change that will also help with making your pages more visible to search engines — something we take very seriously. When using 1.6.6, all newly-created web pages will have their default file names use dashes, not underscores, for separating words. (e.g. “hello-there.html” instead of “hello_there.html”.) Your already-published web pages will not be affected by this change. You’ve no doubt heard about the devastation from last week’s earthquake in Haiti. Well, our fellow “indie” developer, Justin Williams of Second Gear Software, decided to do something to help. He has rounded up over 125 developers, with over 200 Mac and iPhone applications, who will be donating all of their proceeds from sales made tomorrow, January 20 to organizations working to help those in need. The participating companies and their applications are listed on the Indie+Relief website. Naturally, Karelia Software is one of them. We will be donating all our proceeds from sales made on Wednesday, January 20, to Doctors Without Borders (Médecins Sans Frontières). We hope you will visit Indie+Relief and pick up some spectacular software for yourself (or as a gift to your fellow Mac users) while doing good. From time to time, we like to highlight other Mac software titles that we think you may like. This time around, we are shining the spotlight on MemoryMiner, a unique application from a fellow indie developer. Since many Sandvox users publish websites about people and places, we thought that MemoryMiner is definitely worth a look. If you have a big collection of photos of your family and friends, you may find this to be a great complement to iPhoto — and to Sandvox. MemoryMiner lets you zero in on the stories depicted in your photos by linking them to each other based on people, places and time. MemoryMiner publishes to the web either to Flickr, or to a gorgeous web viewer which can be linked into any Sandvox-produced website. Here's an example. The best way to understand MemoryMiner is to watch the demo video on the home page for MemoryMiner 2.0. It’s also a chance to see pictures of MemoryMiner’s author, John Fox, being tormented by his older brother when he was a child! This is the latest in our monthly feature for our newsletter, spotlighting a few Sandvox-created websites that we think show off the application’s features well. We hope these examples will give you some inspiration for your own Sandvox site! We are all human, and human beings tell stories. This makes us all writers. Whether you have years of experience and published work under your belt, or you can’t stop thinking about that story you wrote in Grade 11, or even if you’ve never put pen to paper before, know that you are a storyteller, and you are a writer. 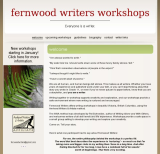 The website is simple, but extremely elegant: Her choice of the fern image with the color scheme of Sandvox’s “Brown and Green” design makes for a perfect combination. 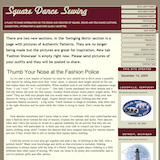 Karen Reichardt of Spokane, Washington describes her website “Square Dance Sewing” as “a place to share information on the design and creation of square, round and folk dance clothing.” The site uses the flexible “Expansion” design, known for its adaptability to narrow and wide window widths, as well as its vertically-oriented site menu that allows for big sites. Karen has used a range of Sandvox features such as a page counter, image pagelets, a contact form, site map, but she has also made great use of the rich text page, incorporating text and images in most of the site’s pages. Per-Erik Frid, of Borlänge, Dalarna, Sweden, built his website “Fridde” to describe his past and the things he does today. He used the Blueball Design’s “Snapshot” design — the orange variation. The site features a blog (with comments provided by JS-Kit/Echo), many photo albums featuring motorcycles and his travels, lists of links, and so forth.